The CR rich in biodiversity and the most prominent among them recorded so far have been the avian, fish and floral diversity. As per the existing records and preliminary surveys undertaken by the planning team, a total of 42 species of fishes, including 15 endangered and threatened species, were recorded from this wetland. The CR is an important satellite wetland in close proximity to Pong Dam (Himachal Pradesh) & Harike lake, and this landscape is an abode for migratory birds (about 40,000 birds belonging to 45 species) that flock the area during winter season starting from November till March every year. 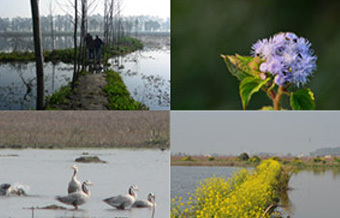 Keshopur Chamb Community Reserve (KCCR) is situated in Gurdaspur district of comprising of a fresh water marsh. The entire area of this community reserve (CR) is owned by five village Panchayats. Historically spread in few thousand acres from Paniyar up to the river Ravi, the wetlands have now shrunk due to the conversion of wetland habitat into agriculture land and fish ponds. The ecological boundaries of this ecosystem extend much beyond boundaries of the CR and the entire tract serves as an important habitat for many migratory birds. 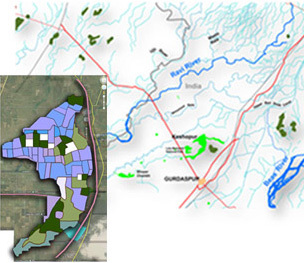 Currently 83% of the total area in the CR is under active human use in the form of fish ponds, cultivation of lotus and Trapa (singhara) through long term lease mechanisms. In fact these land use are fast expanding both in terms of area and intensity. The activities not only directly deplete the diversity of native species within the ecosystem and habitats, but also have prolonged impacts in the quality of water due to extensive use of organic chemicals in the form of pesticides and insecticides. Some other major threats are rapid land use changes outside the CR and adjoining landscape, fast spreading invasive species of water weeds and increase in demand for land and higher income. 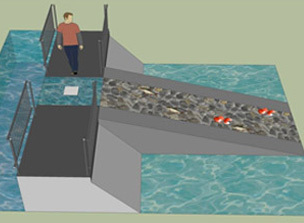 The project proposal has been designed with the goal of conservation of Keshopur wetland, creating conditions for wintering of more migratory birds and creating sustainable livelihood opportunities for local communities without disturbing the biodiversity and environment. 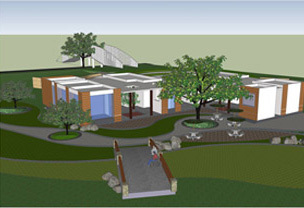 The physical infrastructure components have been proposed with minimalist design treatment with use of eco sensitive materials.